Etuk Ubong and his band play an energetic blend of Afrobeat and Jazz. Following the release of his latest single Black Debtors, Etuk Ubong is exploding onto the UK music scene. With a previous residency at Jazz re:freshed and a recent performance at BrainChild festival in Brighton, Ubong is bringing his monumental experience and knowledge to Bristol now! Collaborating with musicians such as Seun Anikulapo Kuti at the Barbican Centre Garden Party and Dele Sosimi at Hackney’s Oval Space demonstrates the strong roots Ubong has within the African music sphere and are a clear marker of his success as a solo artist. Ubong was born in Nigeria in 1992 and was raised in the city of Lagos. 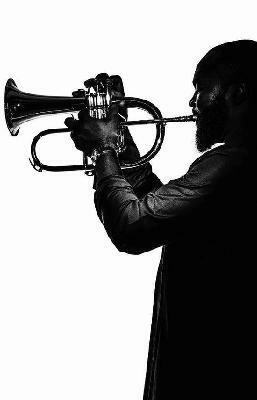 His mother’s encouragement steered him towards the trumpet at just 14 and he went on to study at the Peter King College of Music and MUSON school. As a teenager, Ubong was taught by top Nigerian trumpeters Etop Adolphors and Victor Olaiya before being invited to join Victor Ademofe’s band. He played for four years, followed by a two year stint with reggae artist Buchi, after which he returned to play with Ademofe at the Lagos International Jazz Festival in 2012. 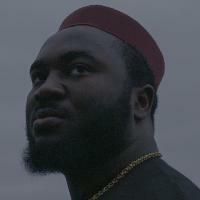 With such incredible achievements by the age of 21, Ubong’s reputation was so impressive that he was hand picked by Femi Kuti to join his band for the next two years, touring Nigeria and Ghana. Ubong continued to work in various ensembles and in 2015 he represented Africa at the International Trumpet Guild conference in Ohio, where he is a member. Later on that year he played in Jamie Cullum’s On Mass project as part of the London Jazz Festival. To expand his knowledge, Ubong relocated to South Africa in 2015 to study jazz at the University of Cape Town. Here, he formed the South African Etuk Ubong Quartet with three other rising talents at the time; pianist Ludwe Danxa, double bassist Shakeel Cullis and Keno Carelse on drums. Making a name for themselves on the South African jazz scene, the band were invited to play at some of the cities top live jazz venues such as The Crypt Jazz club, African Freedom Station and The Orbit Jazz Club. The band was also selected as one of the top 5 finalists in the espAfrika Young Legends Competition in 2016. Etuk Ubong explored multiple collaborations in South Africa with artists such as Nduduzo Makhathini, Benjamin Jephta and Ayanda Sikade and performed as a solo artist at Artscape Youth Jazz Festival in 2016. Ubong released his EP Miracle in 2016 with another quartet formed of Nigerian artists; Timothy Ogunbiyi on the piano and keyboard, Isa Samson on bass and Tombrapade Robert on drums. This comprised four original compositions which reflect his Nigerian heritage as well as his life philosophy of goodwill, peace and love to humanity. Following the success of Miracle, Ubong released his debut album, Tales of Life in 2017. This featured Timothy Ogunbiyi again joined by Taiwo Ibidun on trumpet, Raphael Lasisi on tenor saxophone, Emmanuel Akinloye on bass and Benjamin James on drums. Featuring eight original compositions, Ubong uses this album to explore his deep concern for justice and equality. Etuk Ubong talent has been nurtured and guided by some of Africa’s greatest musicians for over a decade. With such an exceptional record of collaborations since he was just 16, Ubong’s relationship with music has flourished throughout his life and allowed him to follow a creative journey that has lead him to his current peak as a solo artist. On support for the night we have Bristol's own improv 4 piece, the Iceman Furniss Quartet. Known throughout the city as a leading light in the Jazz scene, both for their musical prowess and the events they promote (Improv's Greatest Hits), we're very excited to be able to present them alongside an international Jazz outfit. DJing around the live music will be The Grey Area's resident DJ, Siegfried Translator, playing a selection of outsider-Jazz, psychedelic oddities and music from the African continent. We want all of our events to be a safe space for everyone and as such operate a zero tolerance policy towards any acts of homophobia, transphobia, sexism, racism, ageism, ableism or anything that may make someone else feel uncomfortable or at risk. If anyone experiences or witnesses this on the night let us know and it will be dealt with swiftly.